What is Teachers Day | When And Why Do We Celebrate It? Teacher has a special identity not only in Indian society but also around the world. Teachers Day is one of the very special day for both teachers and students in Indian schools and colleges. 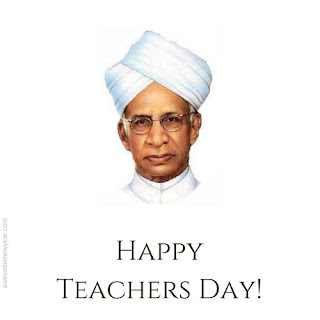 On every 5th September it is celebrated as Teacher’s Day in India. It’s the mark of tribute to the Teachers for their contribution to the society. These lines are taken from Taittiriya Upanishad! Achaya Devo bhava, Generally means “Honour the Teacher as God”. A Teacher has given the most importance after mother and father. On every Year, 5th September it is celebrated as Teachers Day. 5th September is the birthday anniversary of a great teacher Dr. Sarvepalli Radhakrishna. On his birth day we celebrate Teacher’s Day throughout the world. To Honour the teacher’s for their contribution to the society, in every school and college in India we celebrate Teacher’s Day. Before to get to know why we celebrate teacher’s day on 5th September, we should know about Dr. Sarvepalli Radhakrishna. Dr. Sarvepalli Radhakrishnan (5 September 1888 – 17 April 1975) born in a piligrim town of Tirutani, Tamilnadu. He is well known as a teacher, philosopher and the first Vice President (1952-1962) and second President of India (1962-1967). He has done research in Philosophy from Christine College, Madras. He started his career as a professor at Presidency College, Madras and he was extremely popular among students right from early days of his teaching. He was offered the professorship in Calcutta University when he was less than 30 years old. Later he served as a Vice Chancellor (VC) for Andhra University, Visakhapatnam from 1931 to 1936. In 1939, he was appointed the Vice Chancellor of Banaras Hindu University. He has contributed a lot to teacher’s community in in India. In 1952 Dr. Sarvepalli Radhakrishnan was chosen to the first Vice President of Republic of India. From 1962 to 1967 he served as a President for India. When Dr. Sarvepalli Radhakrishnan was serving as the President of India, some of his friends and students requested him to allow them to celebrate his birthday, on 5 September. Then he replied to them, "Instead of celebrating my birthday, it would be my proud privilege if September 5th is observed as Teachers' Day." In every school and college in india, students and teachers together celebrates Teacher’s Day on 5th September. On this day students honour their teachers. Some students give gifts to their favourite teachers. There will be special speeches from students and teachers. Cultural events are the main of teachers day in every school. Students make their teachers happy with their Acts, Dance performances etc.